Mano has been the Managing Director of MRDC since 2008. He was initially appointed under a contract worth K750,000 per year. As well as his full-time position at the MRDC, Mr Mano has an extensive network of business interests, many owned through SMA Investments Limited and the Handy Group of companies. In 2015 Mano paid K6.5 million for a 50% interest in Civil Contractors Pacific (CIVPAC) Limited. Mano has been citied three times in the reports of the Auditor General in relation to alleged tax evasion. Mano has also been linked in the literature to various allegations of mismanagement, none of which have been substantiated. He has been Managing Director of MRDC since March 2008. MRDC has major investments in property development and hospitality within PNG, Fiji and Solomon Islands. Previously, Mr. Mano was a consultant with the Department of Petroleum & Energy on major petroleum projects in PNG. Mr. Mano also serves as Chairman and Director in a number of entities, including MRDC and related companies, Hevilift Group, Insurance Pacific and Pearl Resort. Mr. Mano has been a Non-Executive Director of Bank of South Pacific Limited since August, 2014 and a Non-Executive Director of Airlines of Papua New Guinea Limited since March, 2010. In addition to his full-time position as Managing Director of MRDC and numerous Board positions, Augustine Mano has built a considerable business empire involving more than 20 companies registered in PNG, several businesses in Fiji and at least one company registered in Hong Kong. Augustine Mano is the sole director and shareholder of SMA Investment Limited, which was registered in 2003. Through SMA Investment Limited, Augustine Mano owns a 50% stake in the high profile contracting business Civil Contractors Pacific Limited – more commonly known as CIVPAC. SMA Investment paid K6.5 million for 50% of the shares in CIVPAC in June 2015. 50% of Papuan Drilling Limited. Although incorporated in 2011, Papuan Drilling has never filed an annual return. 50% of Terra Resources Limited, a company incorporated in 2014. Like Papuan Drilling, Terra Resources has never filed an annual return but in July 2015 it did borrow K146,467.83 from First Investment Finance to buy a new Toyota Land Cruiser. 50% stake in Leisure Holidays and Travel Limited. The other 50% is owned by a company called Richos Limited. The Directors of Leisure Holidays are Augustine Mano and Sundaram Srinivasan. Srinivasan is the owner of Richos Limited, which holds the other 50% stake in Leisure Holidays. SMA Investment and Richos bought Leisure Holidays in 2007. Additionally, Srinivasan owns Bogasi Limited, which holds a 50% stake in Civil Contractors Pacific. 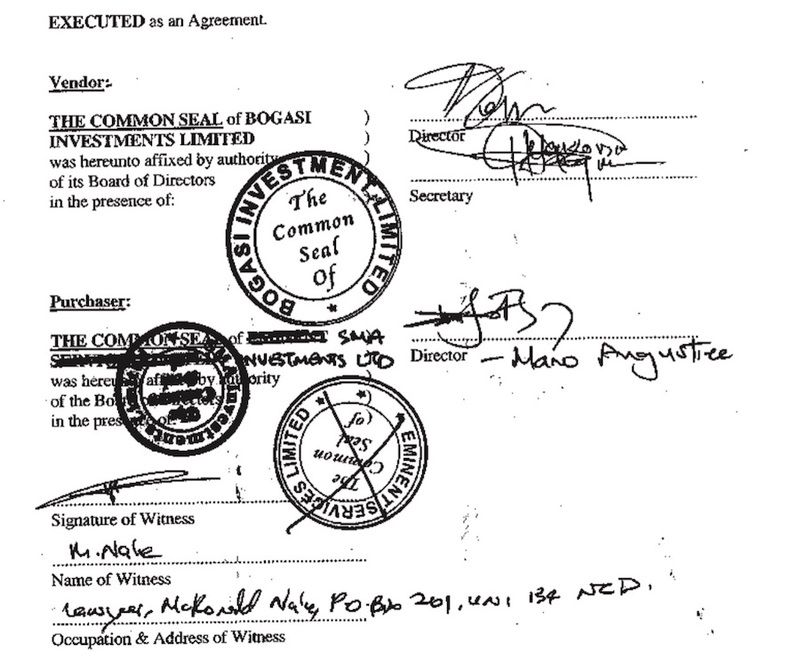 Mano paid Bogasi Limited, K6.5 for his stake in that company. Bogasi Limited is the company that, according to information supplied by MRDC to the Auditor General, provided a loan to SMA to purchase a Toyota Landcruiser for Mr Mano in 2008 when he took up his position as Managing Director of MRDC. Manu and Srinivasan are also linked through Vixen No.28 Limited. Mano’s company SMA Investment was previously the joint owner, with a company called Sumadest Limited, of Vixen No.28. SMA sold its half share in Vixen to Sumadest in 2015. Sumadest is owned by Sundaram Srinivasan. Previously, it was Sumadest that bought Vixen No.28 in 2007 and sold half to Mano via SMA Investment in 2008. SMA Investment is also the joint owner of Yawenaik Holdings Limited. Sanamo Group Limited own the other 50%. Sanamo is owned by Joseph and Malcolm Kobol. Yawenaik Holdings was registered in 2011, but has never filed an annual return. Mano, through SMA Investment, is the sole owner of Davara Estates Ltd – a company registered in February 2016. 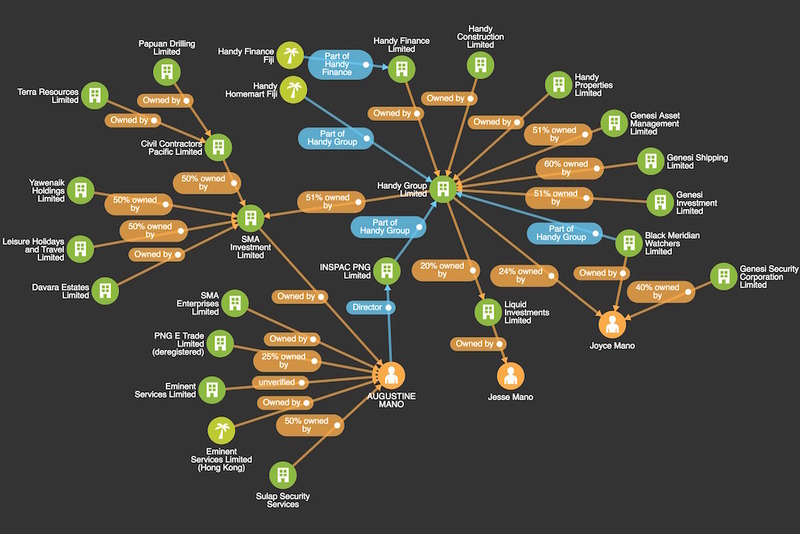 Mano, through SMA Investment is also the majority (51%) owner of Handy Group Limited. The other shareholders in Handy Group are Joyce Mano (24%), Liquid Investments Limited (20%) and Thomas Dara Ola (5%). Liquid Investments is, in turn, owned by Jesse Mano – so the Mano family control 95% of Handy group (and its subsidiary companies). Handy Group is the sole shareholder in Handy Finance which, according to its latest annual return, has 18 full time and 3 part-time employees. The company provides personal loans. There is also a Handy Finance operating in Fiji, which as well as personal loans offers hire purchase financing and business loans. According to its website, Joyce Mano is the Executive Director and it has been reported the company has more than 6,000 personal clients. Handy Group is also the sole shareholder in Handy Construction, which has forgotten to file an annual return since 2011. Handy Group also owns 51% of the shares in Genesi Asset Management. The other shareholders are the Fijian based Genesi Asset Management Limited (44%) and Morning Star Ltd (5%). Fijian’s Josaia Gucake and Atunaisa Koto, own the Genesi name in Fiji. The Handy Group also owns 60% of the shares in Genesi Shipping. The Fijian company with the same name, Genesi Shipping Ltd, owns the other 40%. Jesse and Joyce Mano and Josai Gucake and Atunaisa Koto are all Directors of the PNG registered Genesi Shipping. Handy Group also own 51% of the shares in Genesi Investment. The other shareholders are the Fijian Genesi Asset Management Limited (44%) and Morning Star Ltd (5%). Jesse and Joyce Mano and Josaia Gucake and Atunaisa Kotoare are among the directors. Handy Group is the sole owner of Handy Properties Limited, which changed its name from Better Homes Limited in December 2016. Handy Group acquired Better Homes in 2009 – from its previous owners, Augustine, Joyce and Jesse Mano! Augustine Mano was also previously a minority (25%) shareholder in PNG E Trade with Tommy Tomscoll (45%) Joe Karl Ala (14%) and Albert Conrad Mellam (8%) and David Kavanamur (8%). The company was deregistered in 2006. Augustine Mano is the joint owner with Joe Karl Ala of Sulap Security Services. The Company was registered in 2000 but has failed for 16 years to file an annual return. Augustine Mano is possibly also the owner of Eminent Services Limited. The sole shareholder in Eminent Services is listed as EMS-Eminent Limited, a company registered in Hong Kong. There appears to be no such company as EMS-Eminent registered in Hong Kong, but there is an Eminent Services Limited registered there, with an Augustine Mano as sole shareholder and sole director. Augustine Mano is also a director of INSPAC (PNG), together with Madiu Andrew, Sundaram Srinivasan and Dickson Tasi. According to the Handy Group website, INSPAC is part of the Handy Group of companies. The Handy Group website also lists Black Meridian Watchers in as another member of the Handy Group. Black Meridian Watchers Security Limited is owned by Joyce Mano. Augustine Mano is also the sole director and owner of SMA Enterprises Limited, registered in October 2016. Finally, Augustine Mano is also a director, in his role as MRDC MD, of Hevilift, PNG Air, PNG Ground Services and a whole heap more companies MRDC has invested in. Handy Group, through its website, also claims ownership of the Handy Finance and Handy Homemart businesses in Fiji, INSPAC (PNG) Limited and Black Meridian Watchers Limited. Augustine Mano owned 25% of PNG E Trade until the company was deregistered. The Mineral Resource Development Company (MRDC) is a State owned entity that manages landowner equity interests in mining and petroleum projects on behalf of landowner companies. Augustine Mano has been the Managing Director since March 2008. SMA Investment Limited [see SMA and Linked Companies above] is a Papua New Guinea registered company owned by Augustine Mano as the sole shareholder. Section 4 of the contract states that MRDC will pay the Managing Director and SMA Investments Limited a monthly fee of K62,500 (K750,000 annually, GST excl.) based on an invoice provided by SMA Investment Limited. However, the Managing Director had written to the payroll division of MRDC advising that his package be structured into two components; where K150,000 was to be paid as salary to him through the MRDC payroll and K600,000 was to be paid to SMA Investments Ltd at K50,000 per month. The K50,000 monthly payment to SMA was divided into Housing (K20,000), Vehicle (K20,000) and other allowances (K10,000). A managing director or director of a company is always a natural person. The Managing Director of MRDC is an employee of MRDC. All benefits of any employees are classed as salary and wages and must be taxed according to the tax rules applicable. 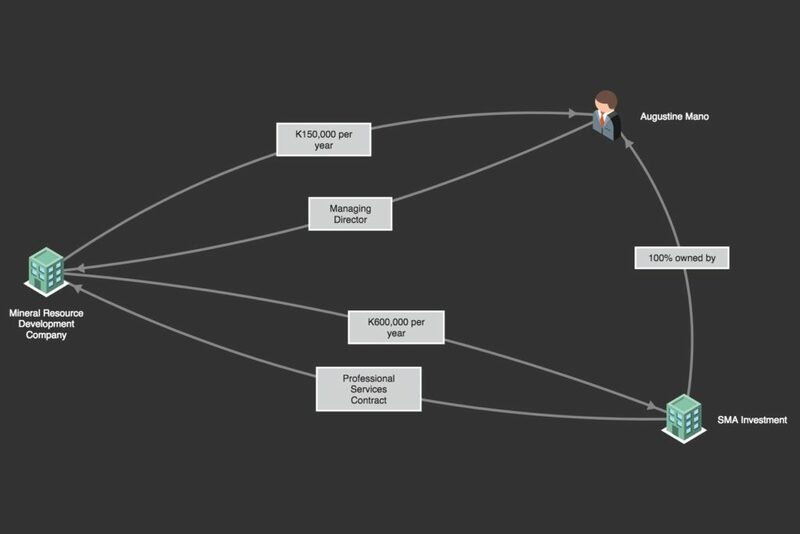 The current arrangement of the Managing Director can be viewed as a measure to reduce or evade tax. Should MRDC continue to allow this, the IRC can deem the payments as net of tax and demand MRDC to pay the tax. There are penalties for both the employer and employee pursuant to Section 361 of the Income Tax Act, 1959. Such a scenario can lead to undesirable consequences for both parties. I recommended to the management to seek independent tax advice from reputable accounting firms immediately on the consequence of this arrangement and assessment of the underpayment of tax. The management should withhold making the monthly payments to SMA until the tax advice has been sought. Tax packaging of the Managing Director’s salary and wages should then be done following this advice. The Auditor General report records that Management responded to his concerns by saying the salary packaging was done “to cater for his current needs… as opposed the view that this was done to evade tax”. According to the Auditor General, management claimed this “is an acceptable practice. It was applied with previous Managing Director’s and there were no issues raised in either the previous audits or the tax office to-date. Management will, however seek independent tax advice to confirm the above arrangement”. In my 2008 management letter to the Board and management of MRDC, I have raised concern that this arrangement may be viewed as tax evasion. I have recommended in that letter, that the management of MRDC should seek independent tax advice from reputable accounting firms immediately on the consequence of this arrangement and assessment of the under payment of tax. I also recommended that the management should withhold making the monthly payments to SMA until the tax advice had been sought. The Management of MRDC had responded to my 2008 management letter points, stating that the restructure was not an attempt to evade tax, but was a normal practice applied by MRDC to cater for the Managing Directors‟ current needs. Management also agreed to seek independent tax advice to confirm the above arrangement. However, during the course of my audit of the year ended 31 December, 2009, I have not been provided with any reports compiled by the independent tax advisors to confirm the above arrangement. Due to the inaction by the MRDC management to seek further advice and clarification from IRC, I was of the view that the management is deliberately allowing this anomaly to continue. The Auditor General’s report for 2012 again raises the issue of the tax avoidance and states this was reported to the relevant Ministers in June 2013. The Company had not submitted its financial statements for the years ended 31 December 2012 and 2013 for my inspection and audit. The subsequent reports of the Auditor General are not publicly available. According to Investment Promotion Authority records, in June 2015, Augustine Manu extended his network of business interests by paying K6.5 million to buy a 50% stake in the company Civil Contractors Pacific Limited. The company is often referred to as CIVPAC. It is not known why Augustine Mano originally wanted to use an offshore company to buy his stake in CIVPAC or why he later ditched the idea of buying through Eminent Services and instead used SMA Investment. Augustine Mano has been linked in the literature to various allegations of mismanagement, none of which have been substantiated.